Yoke is the first major summit on the long steep sided ridge that forms the eastern border of the Troutbeck valley, acting as a southern buttress and less dramatic copy of Ill Bell. The two fells share a similar shape, with steep but fairly smooth western slopes and rocky eastern slopes with impressive crags, but while Ill Bell continues to climb to an impressive peak, Yoke ends with a gentle grassy dome, so doesn't quite have the same dramatic appeal. From Troutbeck it appears as the start of the long distinctive eastern wall of the valley and doesn't really stand out as a separate fell - that is only really clear from the east. The most impressive view of the fell is from the north-east, where it forms part of the craggy backdrop to the Kentmere Reservoir. From this angle the slopes around to the top of Rainsborrow Crag appear as a dramatic ridge-line, although on the ground there is a somewhat wider slope behind the skyline. The standard way up Yoke is to climb to the top of Garburn pass and then head north along a path that climbs up the ridge, eventually following a wall that runs along the ridge. The fell can also be reached along the ridge from Ill Bell. An alternative approach from Troutbeck is to follow the path that runs up the hillside from the track north of Long Green Head. This brings you to the less steep upper slopes which can be crossed to reach the normal path. We visit Yoke on the Kentmere Round. The summit of Yoke is a grassy dome with a few scattered rocks amongst the grass. The north-eastern boundary of Yoke is formed by a nameless beck that flows out of Rainsborrow Cove into the Kentmere Reservoir. The eastern boundary is formed by the River Kent as it flows south through the valley. Taking watercourses as our boundaries Yoke ends were an unnamed stream runs across the ridge, splitting it from Buck Crag/ Garburn in the south, running west into Trout Beck. This makes the south-eastern boundary Bryant's Gill, which flows out of the cove between Yoke and Castle Crag and runs into the Kent. 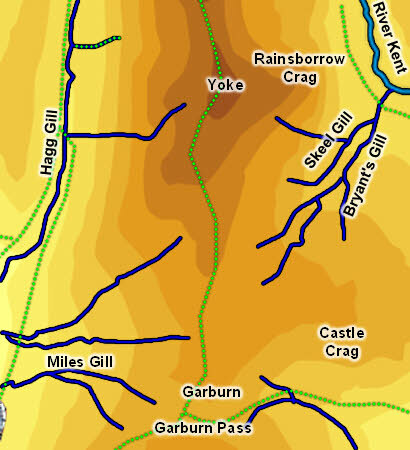 If we decide to take Yoke as far south as Garburn Pass then the boundary is formed by Hall Gill in the east and Miles Gill in the west. On the western side there is no stream to mark the boundary between Ill Bell and Yoke - the streams on that flank rise entirely on Yoke. The western boundary is formed by Hagg Gill and then Trout Beck. There are plenty of unnamed becks on the fell, but only one other named beck - Skeel Gill, which runs parallel to Bryant's Gill. There is a small tarn above Rainsborrow Crag, east of the summit. The fell also has a footing on the Kentmere Reservoir.